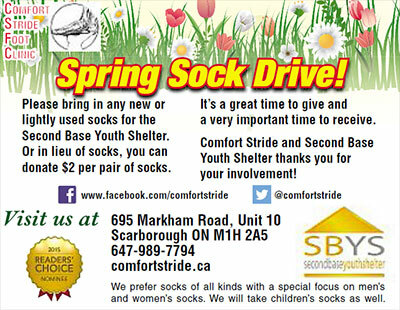 Comfort Stride & Second Base Spring Sock Drive! Please bring in any new or lightly used socks for the Second base Youth Shelter. Or in lieu of socks you can donate $2 per pair of socks. It’s a great time to give and a very important time to receive. Comfort Stride and Second Base Youth Shelter Thanks you for Your involvement!